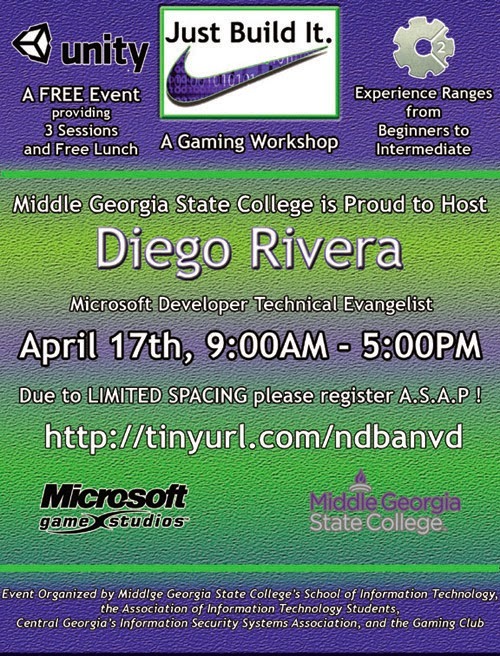 Yesterday I had the opportunity to go to the Middle Georgia State College to have a full day presentation. We were covering game development with Construct 2 and Unity 3D. In the middle of the presentation I had the surprise to be introduced to Sitarah Coote from the WMAZ News Channel. You can check the video and have a good time and see me go completely fan boy talking about video games and game development in general. The people at GMSC were great, not only we have a good number of attendants, but I could tell during the workshop that they were genuinely interested in the different tools and had their minds racing with new ideas and projects. It was also quite gratifying to see several high schoolers and dad/sons couple that were loving the entire experience, and you can see a couple of them during the video. I can definitively say that the southern hospitality was in the air and I had a blast talking about one of my favorite subjects: Gaming. Thanks to all the faculty and the students that gave me such a warm welcome and hope to see you again really soon.